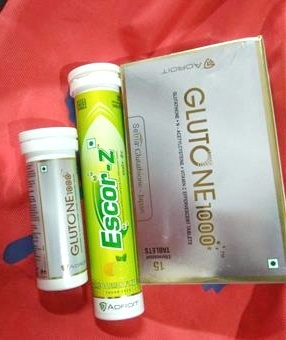 NAME OF THE PRODUCT: Glutone 1000 Tablets with Escor Z Combo. Glutathione is body’s own antioxidant which is critical for optimum health of every cell. It’s often referred as the master antioxidant as it is essential for healthy immune function, detoxification, skin health. Vitamin C helps to increase intracellular stores of Glutathione and works in synergy with Glutathione. Consume daily in the morning on empty stomach. 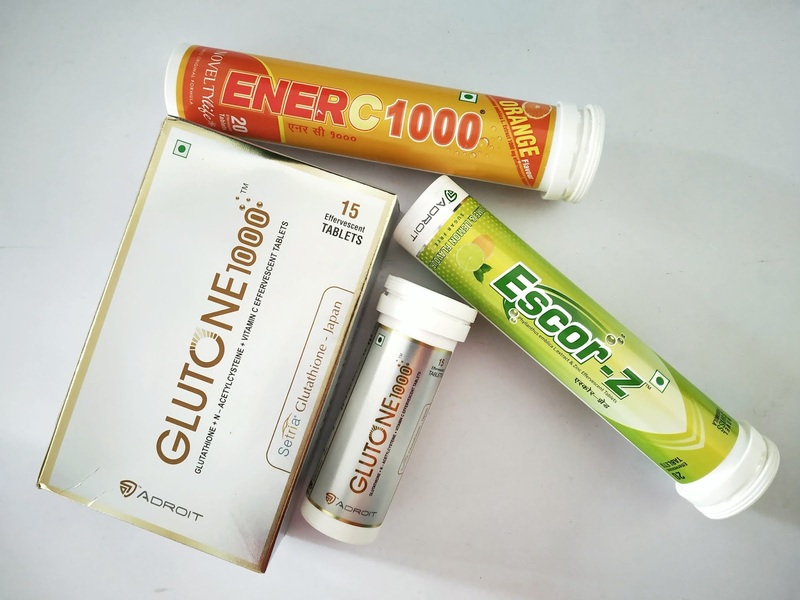 For effective and actual results advised to be taken for minimum 4 months and the results will be visible after 30+ days with optimum use and proper diet. 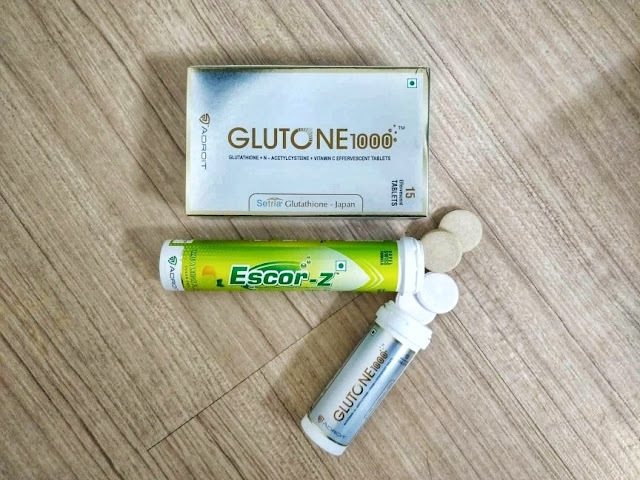 By now you might have got an idea about what it is, but for few of those our cute, naive brides I want to explain in clear what is Glutathione and it's effects and uses in detail. So that by the emd of this post you can be very clear of it's great benefits as skin lightening and you can start incorporating it in your skin care regime. Glutathione is basically a rich antioxidant which is found in several plants and animals. It takes care of important cellular particles in your body and prevents damage. Lack of Glutathione can result in anemia, seizures, anxiety or other disruptions in bodily functions. it is essential for healthy immune function, detoxification, skin health and so on. It's levels in body decline with age, so supplementing oral Glutathione is important to ensure healthy aging. Imparts skin lightening by encouraging production of lighter melanin pigment (pheomelanin) over its darker counterpart (eumalanin). It also helps to boost immunity, stamina and detoxification. Brighten the dull skin and remove pimples or scars significantly. It helps with skin pigmentation as well. NOTE: Supplements have little to no side effects, given that they are derived from plants. They are safe to consume but it is always better to have a professional doctor's opinion at hand. 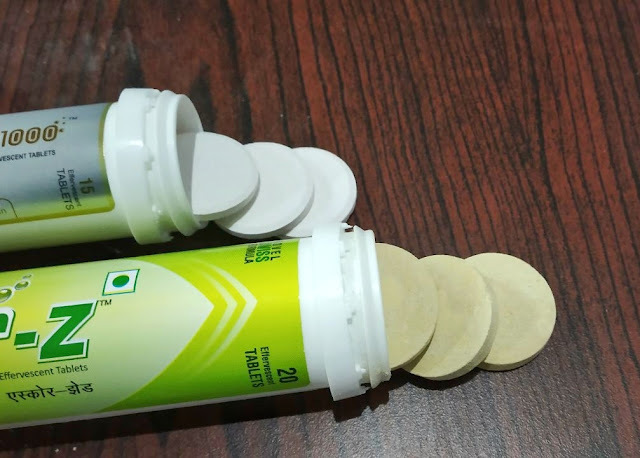 The jar packaging of the pills ensures that they remain fresh and free from any moisture. They can be carried around or kept at a place nearby so you don't forget taking it. The jar is definitely sturdy and travel-friendly. 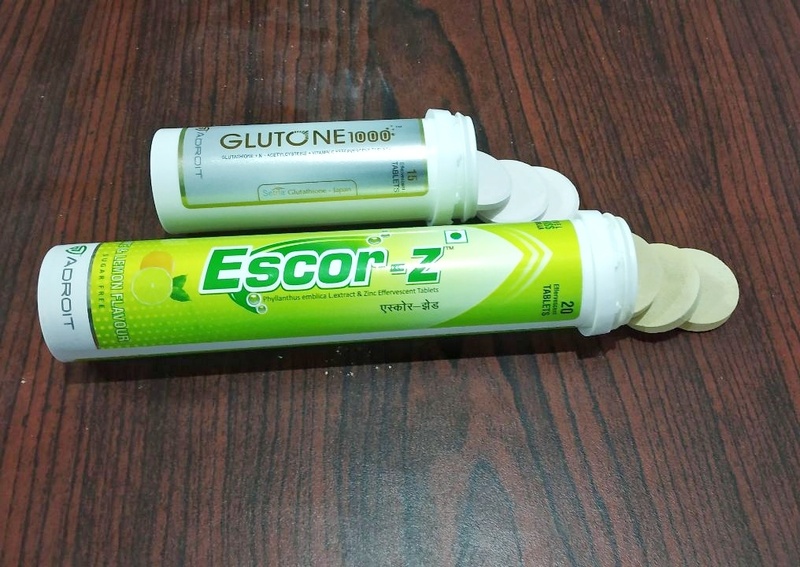 It has a simple packaging which has all the ingredients and usage instructions written on it. These tablets are actually very fun to watch while they dissolve. They turn into fizzy drinks which not only keeps the Glutathione levels up and gives a good view while it gets dissolved. The taste is very yummy and adults can actually enjoy having these. Improves skin tone in both exposed & covered body parts. Contributes to normal immune function & collagen synthesis in Skin. Helps in Photo ageing, Uneven skin tone.and gives skin glow and radiance. Increases production and transfer of anti ageing protein. Exerts photoprotective effects by neutralising free radicals. 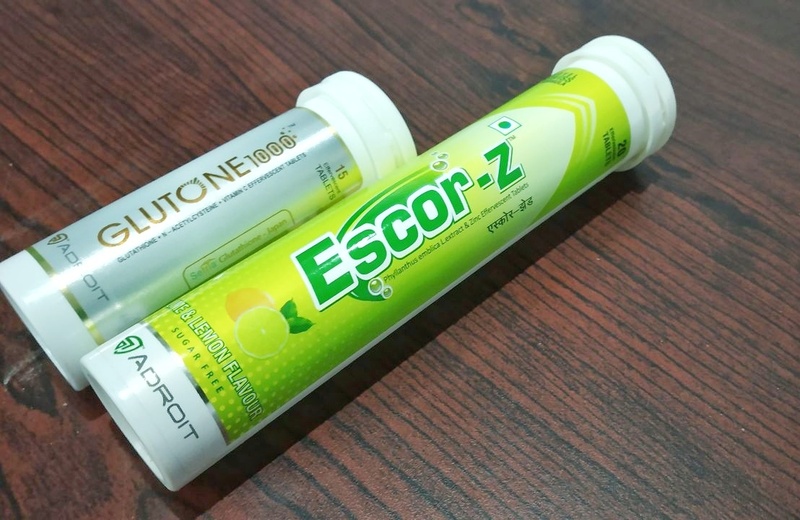 Escor Z increases the working power of Glutone by increasing it's absorption so both taken together gives best results. Glutathione is super essential and having it in the form of a fizzy drink cannot be a better alternative to painful drips. Pills are extremely effective and you can see notable results. They are also packaged neatly and hygienically. This ensures that they remain fresh for consumption. They are fit for both men and women. Taking supplements is absolutely vital in order to enjoy optimal health benefits. You can easily sip these on the go. They are absolutely hassle free as well. The results do vary from person to person. One needs to use these religiously in order to see notable results. These are quite effective in making the skin bright and glowing. They even tend to reduce pigmentation by it's skin lightening properties. They can also improve digestion and help you have a better stamina. They are really good at improving bodily functions. I have noticed that a lot of my blemishes and pimple marks have disappeared. Taking the tablets in the form of a drink is definitely a great way to get your dose of supplements. Cost-effective compared to IV therapy. Works very well as an antioxidant. 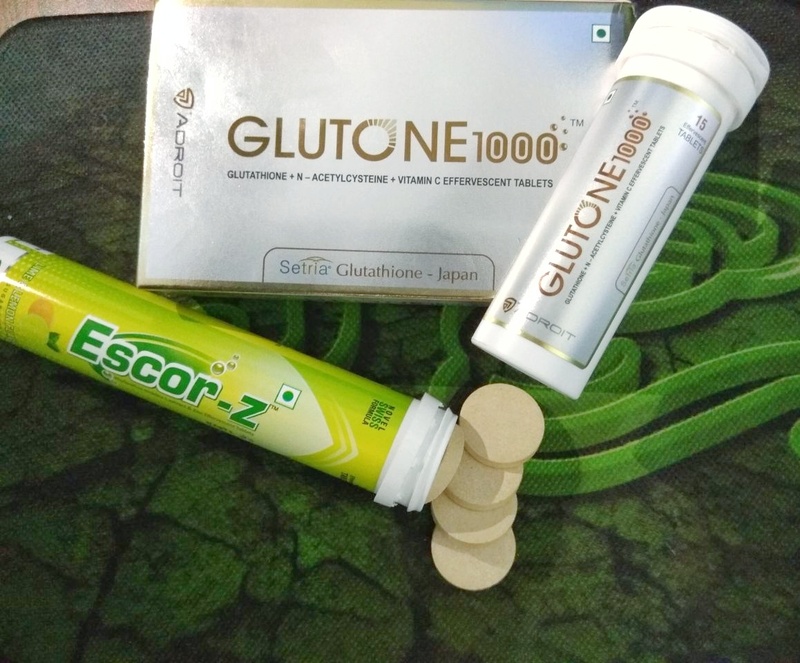 Glutone 1000 Tablets with Escor Z Combo are amazingly effective tablets which can easily help you regulate your body's functions. Additionally, it encourages functions of pheomelanin which lightens the skin tone significantly. It also helps in detoxification of the body. You can effortlessly achieve bright and radiant skin which has a healthy glow. 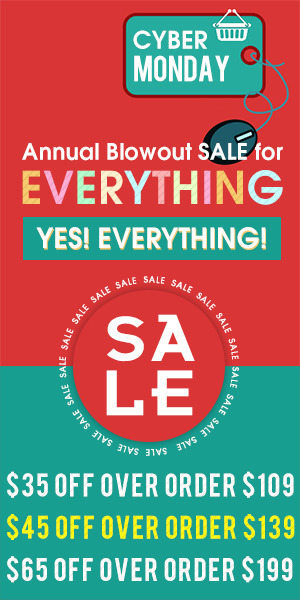 Overall, the tablets are very effective and easy to use. These can provide you the much-needed rich antioxidants which can help you to feel a lot better. So far, I have only seen positive effects of the tablet. It has definitely worked well on my skin and has evened out the skin tone. It is a lot brighter in comparison to my previous skin tone. I have also felt a noticeable difference in my stamina. IBN RECOMMENDATION: I recommend these to those who are suffering from dull, ageing and uneven skintone and having hyperpigmentation etc. along with those having stress, lack of stamina and immunity.